Dr. Jose Velasco received his medical degree from the Universidad Peruana Cayetano Heredia. He completed an internal medicine residency and two fellowships – one in hospice and palliative medicine and the other in hematology and oncology at the Henry Ford Health System. Dr. Velasco is board certified by the American Board of Internal Medicine in Hematology and Medical Oncology, Internal Medicine, and Hospice and Palliative Medicine. Dr. Velasco specializes in the diagnosis, treatment and management of all cancer types, blood disorders, leukemias, and lymphomas. Some of his specialty practices include chemotherapy, intrathecal chemotherapy, and bone marrow biopsy and aspiration. 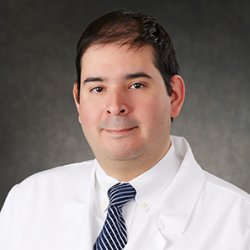 Dr. Velasco is a member of the American Society of Hematology, the American Society of Clinical Oncology, and the American Academy of Hospice and Palliative Medicine.